Updated 01/19/16: Mixmax keeps on adding features that are geared to completely simplify your email productivity. Starting today, you can now use "smart variables" that let you automatically bring in certain information into an email without having to type that information. For example, you can default in a recipient name or sender name into the body of the email. This makes using templates that much more efficient and productive. What makes the templates even better is that you can also share these templates with others to make their life even easier. For a complete list of the available variables see the Mixmax blog post here. Updated 11/17/15: Starting today Mixmax is introducing a very useful feature that works in both classic Gmail and Inbox by Gmail. Introducing Mail Merge, currently in Beta and free for everyone during the beta period. With Mixmax Mail Merge, you can easily customize up to 200 messages to individuals. All you have to do is go to the Mixmax dashboard, select Mail Merge, draft one email, and upload a CSV file of all of the recipients. Images below are from Mixmax's promotional email announcing this new feature. Using double brackets you can add into the body of your email any of the column headers from your CSV file and they will automatically merge into the email. You must have one column heading titled Email in order to add the address in the To: field. Two really nice features of this is 1) you can send yourself a quick test message to see both how it looks and works and 2) the messages are sent directly from your Gmail/Inbox by Gmail so the email will land in the recipient's Primary tab/Inbox instead of Bundles or Categories like other mass mailing tools. Messages sent this way will also appear individually in your sent folder as well. 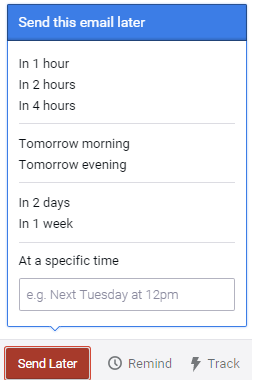 It is important to remember that these messages will still count towards your Gmail daily sending limit as described here. Updated 11/10/15: Mixmax adds contact lists to their email productivity suite. 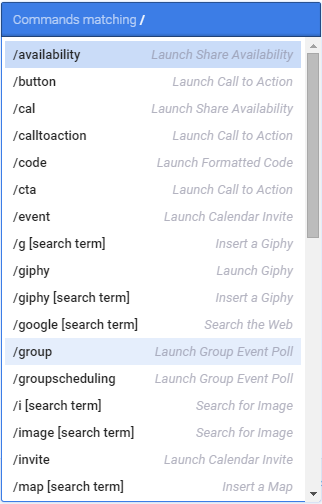 Now, right from within the compose screen (both for Gmail and Inbox), you can quickly save multiple recipients as a contact group. You can use this save group later by just entering the name of the contact group. Users also can edit and update the lists from the dashboard. See images below provided by MixMax. Mixmax's website states their "mission is to do the impossible with email". Well I have to tell you they seem to have accomplished their mission with their suite of features that enhance, customize and improve the email experience for both sender and recipient. I am very happy to say that the Mixmax extension works on both Gmail and Inbox by Gmail. Since Inbox by Gmail is my goto program for everything email, it would make sense that my review of Mixmax focused solely on Inbox. I have to assume that everything works almost identically in Gmail as well. First the pricing. Mixmax offers four levels of pricing depending upon your needs. The pricing structure can be seen below, To see a details of what is included in each pricing package can be found here. There are so many features and enhancements in Mixmax, that I am honestly not able to go into each one. Many of the features are geared towards more power users of email than I am as I am just one man, sending messages here and there. But I do want to touch on the features that not only appeal to me and would be used by me, but also I want to go over the features that Inbox is missing and have had multiple requests from users. 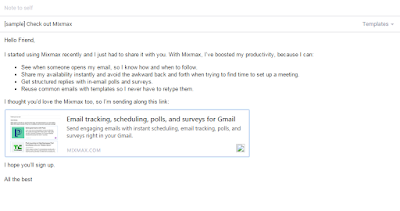 In addition I will review some of the features that Inbox has already but greatly enhances the capabilities. During my review of the product, the team was very responsive to questions. It must be noted that since there are so many features there are multiple areas you need to access to setup. First there is the Mixmax settings page that you can access from within Inbox and Gmail. Second there are settings on many of the Gmail settings tabs that allow the import of options into Mixmax. Most importantly, if you have many email accounts setup as send as accounts, you will need to import those in order to change the send as account from compose. Upon installing Mixmax adds a few new menu items on the left of both Gmail and Inbox as can be seen here. Instant Scheduling - this is a great feature for those that need to schedule many people for different time slots. For example a teacher scheduling Parent Teacher Conferences, or a Manager scheduling employee reviews. You provide multiple times from your calendar and once someone picks that time, the others can no longer choose that. Really neat feature. 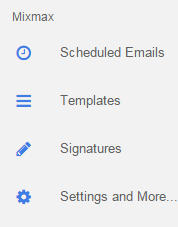 Signatures - this has been one of the biggest gripes of Inbox users to date. Lack of formatting, multiple signatures, etc. Well MixMax really fills this gap for users. You can you format your signature to your hearts content with the signature settings or you can import your existing signatures right from Gmail. Even more impressive is that you can have multiple signatures, one for each send as account setup in Gmail (settings which transfer to Inbox). In addition, Mixmax gives you the option to include the signature in replies, and right after your reply, not all the way at the bottom like Inbox currently does. 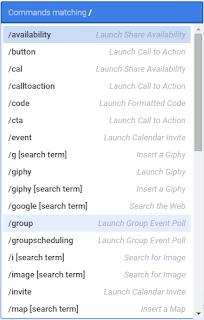 Send Later - this is another feature that I have provided workarounds for and in this case it used a Google Sheets script. 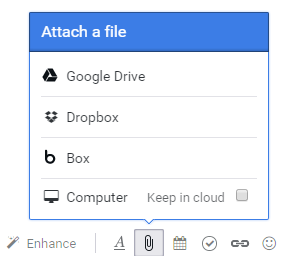 Well Mixmax has brought this right to your Gmail or Inbox with the simple click of a button at the bottom of the compose window. They provide 7 preset times as well as the ability to create a specific time to send later. After the email is scheduled you can see them by clicking on the Scheduled Emails in the new Mixmax menu on the left of the screen. Undo Send - although the Undo Send feature currently exists in Inbox, Mixmax improves upon this as you can change the time frame the popup notification stays on the screen AND it remains on the screen even after taking another action, such as marking another email as done. Inbox currently replaces the undo send with the undo other action. Full Screen Compose and Reply - Mixmax gives you an option in the settings to allow for Full Screen compose and reply. What is really a nice touch is that you can set Compose and Reply separately. Group Event Polling - this is a nice feature that lets you suggest multiple dates and times for an event to suggest to recipients. They choose one, and after you have all of your responses you get to quickly send an invite based on the poll results. Email tracking - this is a feature that has been regularly requested by Gmail account holders, and unless they have a paid Apps for Work account, there is no email tracking. Mixmax offers this feature, and different levels of tracking details are available based on the type of Mixmax account you have. I personally could care less if I know if/when people open my emails. To me, it sort of a form a stalking ;) However for those interested, there is a nice Live Feed section of the settings area where you can see all of your email tracking results. Drive Integration - although I have provided a workaround for Drive integration in another post here, Mixmax has taken Drive integration to a whole new level. They dont only offer Drive integration, but Dropbox and Box as well. 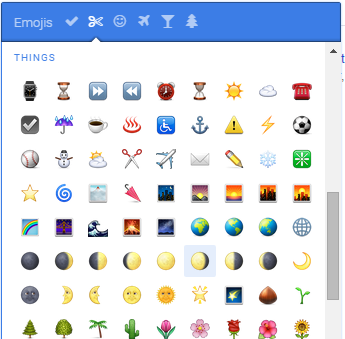 Emojis - I personally have never seen a need for emojis in my email, I have always reserved those little guys for texting only. But for those that miss the old style of emojis from Gmail and want them in Inbox too, now you can. As I stated earlier, this is just a few of the features that can be found in Mixmax. Also possible is a suite of enhancements that can be added via keyboard shortcuts or right from the enhancement menu. For the shortcuts just type /and the shortcut menu will appear. As you can see from the enhancements menu, there are so many more things that you can do with Mixmax. 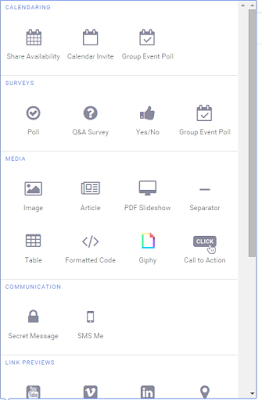 You can add tables, slideshows, calls to action, Polls, surveys, calendar invitations, link previews and even more. I have to say that I was thoroughly impressed with this product. I spent a few days really trying to break this thing and find something wrong with it, and I just couldn't. I highly recommend this product to anyone that needs these types of email enhancements. Full Disclosure: I have not received, at the time of this writing, any incentive or compensation, whether monetary or free access to premium features. Thank you, good comprehensive overview ! 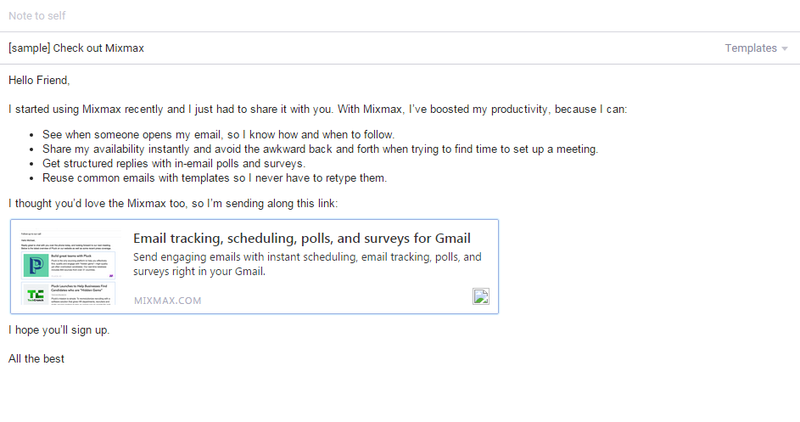 I've tested the Mixmax for Inbox. I dont have those behaviors you describe. Try clearing your cache. As to your last question., I know they have heard this request over and over, so hopefully they are working on it. can I create a group, yet when sending mails to them in cc, do not want their individual email IDs appear but only the name to appear....Is it possible? Good day, Is the pricing for one user only or does it include one main user and sub-users? I think that pricing is per account. I installed mixmax specifically to send group emails. The feature I liked was that you could type in a google contact list into the cc or bbc area and it would automatically add unless there is something I'm missing. When I type in the group contact name, it shows up, but if I try clicking it or pressing enter, nothing happens. Ok Scott, I need some guidance here. Having recently taken your advice to add MixMax to my tool box, I've come up against a problem. In Inbox, I had created some templates. After MixMax is installed, it replaces the options available in the compose window, and the option to access any of the templates I had already created in Inbox was gone. The folks at MixMax were no help, simply telling me to copy my Inbox templates to Mixmax, but the problem is, I can no longer access the templates from the compose window! A catch-22. I don't know where the templates are stored. If they are in the drafts folder, there's no clear indication that any of those drafts are marked as templates. I could go and find an old sent message using my templates, paste into MixMax, and then remove all the customized text I had added on top of the template, but that seems an awfully clunky workaround. Can you help me locate and identify my extant Inbox templates so I can open them and copy them into MixMax?